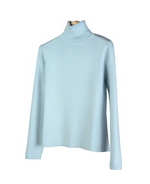 Our ladies&#039; silk spandex v-neck long sleeve sweater is made in full-needle knit and has a natural stretch, so it is easy-fit and easy-care. 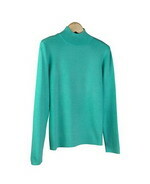 This v-neck sweater has a classic shape because of its subtle waist and straight bottom. 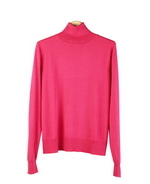 It&#039;s high back styled and flattering neck-line is great for the fall and winter seasons. 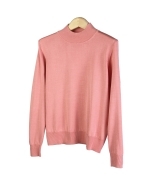 This pullover drapes very nicely and is never clingy. 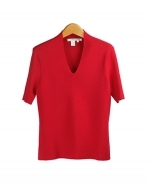 Hand-wash cold and lay flat to dry, or dry clean. Available in sizes XS(4) to women&#039;s plus size 1X(16W-18W). Available in 15 beautiful colors: Banana, Beige, Black, Bone, Brown, Eggplant, Green Leaf, Poppy, Red, Salmon, Sky, Sunflower, Turquoise and White. 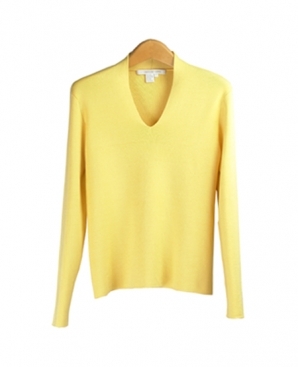 More V-neck sweater pullover styles are pictured below your selection. 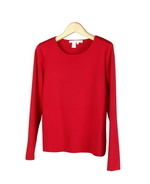 Style TS605 shown below is a 3/4 sleeve silk/spandex V-neck sweater in smooth flat knit. It hold its shape well. 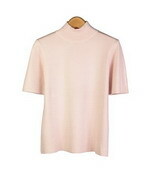 Style 13S is th same style knit as the long sleeve V-neck but it is a short sleeve V-neck sweater.